Fort Lauderdale's Trendy Beach Front Community at the foot of Commercial Boulevard and the Beach is actually in the City of Lauderdale-by-the-Sea. In the City of Lauderdale-by-the Sea new construction has been very limited by the lack of land and the cities desire to keep the small town beach community feel of the area. With this limited amount of available new construction SKY230 a unique opportunity for a few lucky buyers. 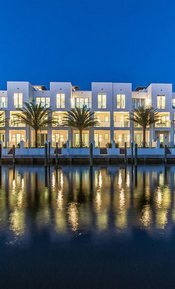 Read more about Sky230 Lauderdale-by-the-Sea's finest waterfront townhomes. Sky 230 is a contemporary development of 29 spectacular waterfront townhomes, SKY230 has homes ranging up to 4500 square feet in size. 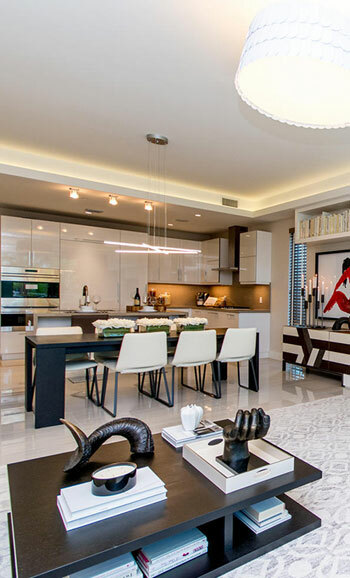 Private elevators and 10 foot ceilings promote the feeling of grand open spaces throughout these townhomes. With prices from just under $1,000,000 to over $2,000,000 these landmark townhomes are sure to be one of the most special addresses in Lauderdale-by-the-Sea. There are private boat docks available for purchase. Sky 230 townhomes are offered fee simple. They offer the finest of contemporary lliving just three blocks from the ocean. The docks availabel at Sky 230 offer unrestrcited ocean access and will hold upto a 30 foot boat. All townhomes at Sky 230 have a private elevator and many offer a "Sky" Terrace with an ocean view. The oversized garages will hold two cars and a golf cart which are perfect for touring the Lauderdale-by-the-Sea community. The kitchens at Sky 230 have Wolfe and Sub-Zero stainles appliances. The homes at Sky 230 heature glass railings, quartz countertops, and led lighting. Naturally pets are welcome at Sky 230.